Description: The Ripple Necklace is a Micro-Macrame pattern featuring the Figure Eight Knot, which is considered a Celtic knot design. The knots are arranged horizontally, and are linked together. There is also a Button Knot in the design, just above the pendant. 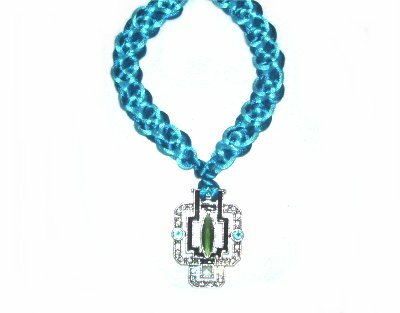 The closure for this Macrame necklace is a standard metal hook and loop. You can change the type of clasp if necessary. The material shown in the example is Satin cord. Since it's delicate, remember to use the Cross-Pin technique for securing the cords. You can also lean the pins over the cords. 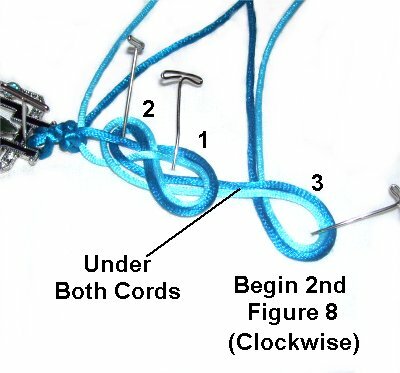 You may find it easier to construct the knots without pins. Cut two cords (two different colors), each the size shown in the chart below. For sizes between those shown, reduce or increase in 18-inch increments. For a Ripple Necklace over 30 inches, multiply the size you need x 8 to get the length of the cords in inches. Divide by 36 to get the yards (or meters). Fold one cord in half (Color A). Tie a Larks Head knot to attach the cord to the loop on the pendan, and tighten it firmly. Secure the pendant to your board, so the cords are horizontal. The working cord is the portion closest to you. The other half is the holding cord. To start the Button Knot for your Ripple Necklace, move the working cord under the holding cord. Make the first counter-clockwise loop. 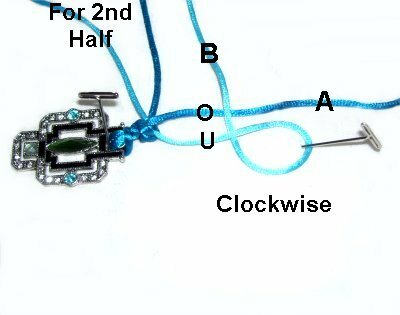 As you bring it back down, it should pass over the holding cord, close to the pendant. Pass the working cord under the holding cord, and then tie the second loop. Make sure it rests on top and to the right of loop 1, creating a small space. Placing a pin in the space makes it easy to identify. Lean it backward over the cord. Pass the working cord under the holding cord. Make the third loop by weaving it through the first two loops over - under - over - under. The end comes out through the middle space. Pass the working cord under the holding cord to begin the fourth loop. Pass it over the right edge of the 3rd loop, under two segments, and out through the space where the pin is located. Tighten the knot in the order the loops were made. Start with loop 2, which tightens loop 1. The final step is to pull on the end. Design Tip: Celtic Button knots are easy to construct but difficult to tighten (unless you've had experience with them). 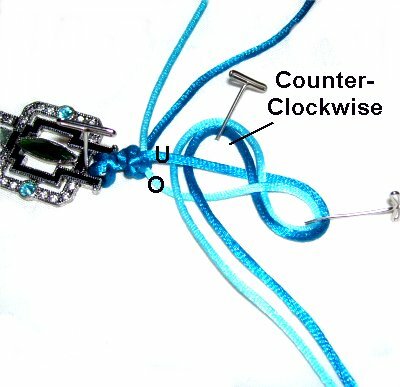 It's purpose is to to prevent the cords from twisting next to the pendant. 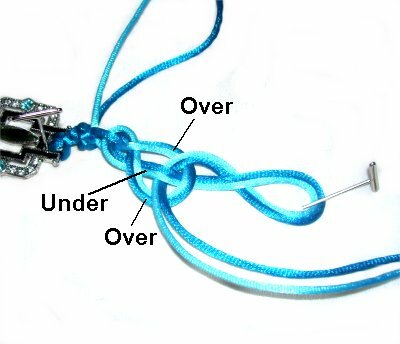 You can use a different knot for this portion of the Ripple Necklace, if this one proves too challenging to tighten. 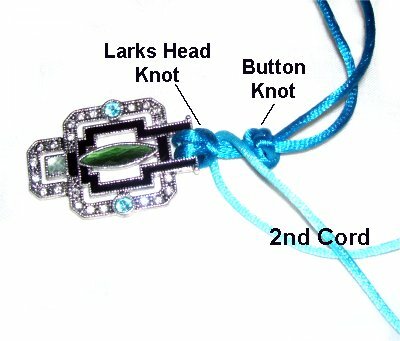 Wrap the second cord (color B) around the segment between the Larks head knot and the button knot. Center it by matching the ends. Pass the ends of Color B through the button knot, using your tweezers. 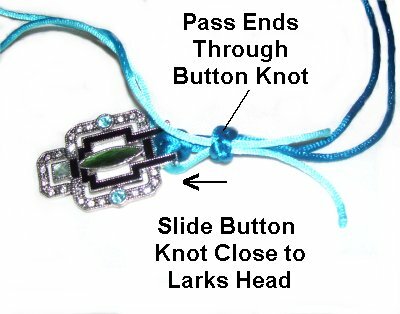 Pull the ends to remove the slack, and then push the Button Knot close to the Larks Head knot. The first Figure 8 knot for the Ripple Necklace is made a little differently than the others, to keep it stable. Arrange the cords horizontally. 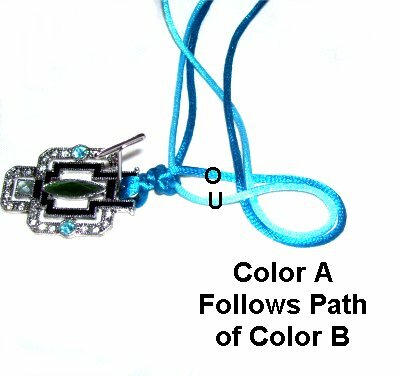 Use one cord of each color for the first half of the necklace design. Step 1: Make a clockwise loop with the Color B cord, which should be the one closest to you. Pass it under to make the crossing point, and over the Color A cord. Step 2: Follow the same path with the Color A cord, fitting it around the outside of the first loop. Design Tip: Notice in the next image the first loop is secured with a single pin, leaning over the cord. Using as few pins as possible is recommended. Step 3: Use both cords together, and rotate them counter-clockwise, to the left of the first loop (closer to the pendant). Pass them under - over the two segments. Leave the figure eight design loose, so there is plenty of space. Step 4: Bring the two cords down to Loop 1, and pass the ends under it. Step 5: Begin the next Figure 8 knot for your Ripple Necklace, by making a clockwise loop to the right of the first. Pass under both cords to make the crossing point. 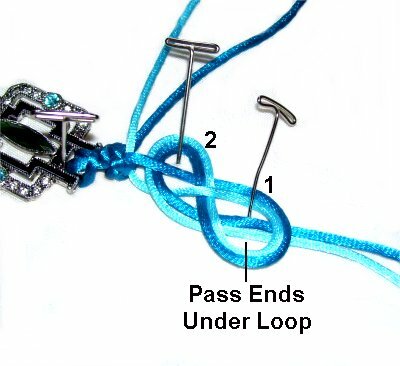 This is how all the remaining Figure 8 knots are constructed. Step 6: Link the two Figure 8 knots by passing both cords through Loop 1 of the first knot. You do this by weaving over - under - over the three segments, rotating counter-clockwise. Step 7: This is the best place to tighten the first Figure Eight knot. It needs to be as small as possible, with the cords next to each other without crossing. First, pull on loop 2 to tighten loop 1 (both cords). Next, pull on the lower segment of the second knot. That's the portion to the right of the place where you linked the two knots. Make sure you do not pull on the ends. Step 8: Repeat steps 4 - 7, tying more Figure 8 knots, until this half of the Ripple Necklace is the size you need. 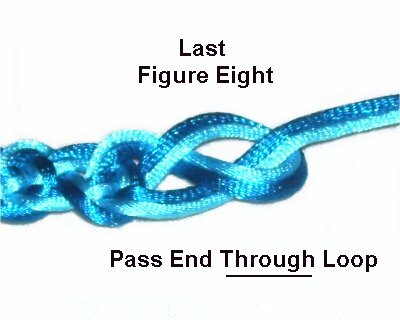 For the last Figure 8 knot, pass the end through the right loop, rather than resting beneath it. Pass through from the bottom to the top. Repeat steps 1 - 8 to make the second half of the Ripple Necklace. Step 9: Pass both ends through the hook for the clasp, if you are using this type of closure. 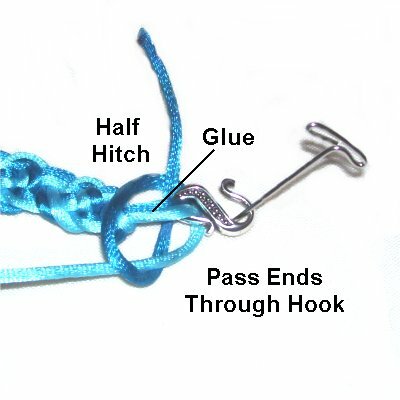 Tie a Half Hitch with one end around the area between the last Figure 8 and the hook. Make sure it goes around the other end as well. 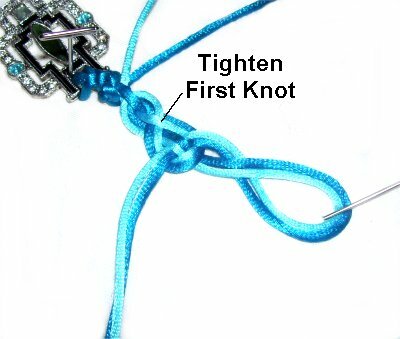 Before tightening it, apply glue just below the hook, so it will be on the inside of the knot. 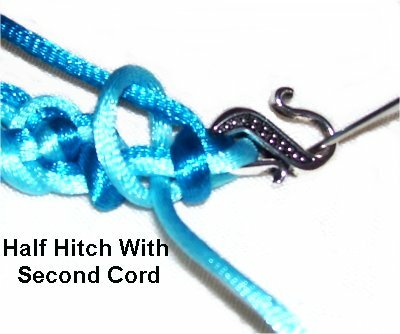 Step 10: Switch to the other end, and tie a second Half Hitch the same way, to the left of the first knot. 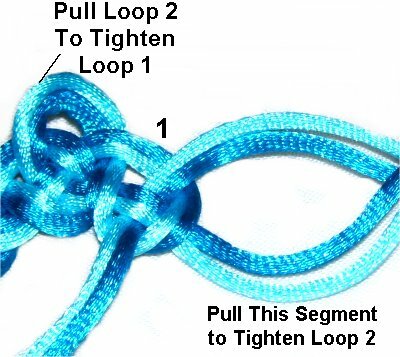 Add more glue to this knot (on the inside). When it's completely dry, cut off the excess material (both cords). Have any comments about the Ripple Necklace? Contact Me.